Diagnostic imaging is a critical part of any veterinary clinic. It gives us the most information in the least invasive way for many diseases. We have a well trained staff and very good equipment to get the right image on the first try. 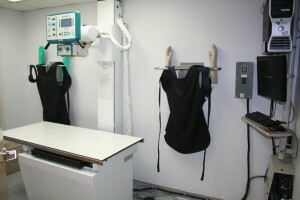 Radiology uses the fact that bodies are made up of varied material to illuminate structures. The whiter portions are more dense (bones, large organs etc.) the black portions are air (areas in the lungs, gas in the colon). Radiography works well looking at dense things (bones), but not as good at looking at less dense things (seeing the differences between tissues and organs). 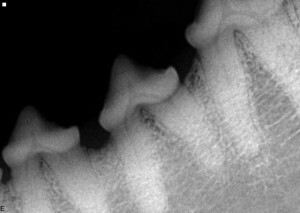 Shades of grey in digital imaging provide more detail than just black and white imaging, and allow for a thorough radiograph interpretation. Veazie Vet has a digital x-ray machine and a grey scale computer that allow us to pick up as much detail as possible. If our doctors have any questions about a radiograph, they are sent to a specialist to read. Results are usually received within hours versus days by mail. Our digital dental x-ray that is used to take radiographs of pet’s teeth. Full mouth x-rays are taken before every dental to diagnose problematic teeth, ensure there are no teeth that need to be surgically extracted and that questionable teeth are in-fact in need of extraction. We can also use it to take radiographs of toes and paws because they are so small. Endoscopy can be performed by any of the doctors. It is a way to view the interior of a hollow organ or passageway such as the throat or stomach. It turns the image into a video which we can see. This is a helpful tool to be able to visualize the back of the throat, take cultures, remove foreign material from the stomach or to visualize the inside of the stomach. Ultrasound is used to visualize tissues such as: tendons, muscles, joints, vessels and internal organs. The probe produces a sound wave that travels through the fluid in tissues and organs and is translated into a visual image that we can see. It is a better tool for seeing the differences in tissues than x-ray and also shows us the motion and function of organs like the heart. Our ultrasound machine also saves digital images that can be burned for you to take with you, or to be easily sent via the internet to a specialist at Telemedicine. 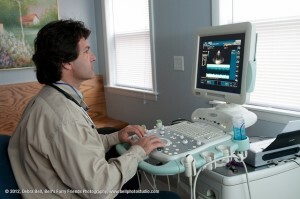 Cardiac ultrasounds (echocardiogram) are performed by Dr. Cloutier as part of a cardiac evaluation. Very few requires anesthesia or sedation. 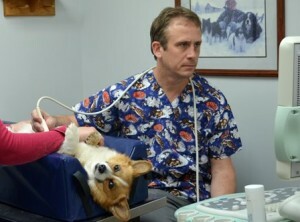 The cardiac ultrasound shows Dr. Cloutier your pet’s heart function. We can visualize the valves, evaluate its size and assess its function. It can also take color flow doppler which illustrates the source of a heart murmur and how significant it is. Abdominal ultrasounds are performed by Dr. McCaw the most practiced ultrasonographer in the area. It permits him to see inside pets without surgery. Some of the most commonly viewed organs are: liver, kidney, spleen and bladder. Its possible to locate and diagnose problems such as: blockages, tumors, malformations, stones etc. We can also check for pregnancy. Pregnancy checks are done by Dr. Keene.We can also perform ultrasound guided biopsies. This is an anesthetic procedure that is minimally invasive and thereby reduces the risks and complications associated with getting tissue samples from an organ.